I was excited to try The Ocean, which is the micro restaurant pod. I guess I was a little disappointed in what we encountered. I was not alone, I think all 3 of us thought it was going to be different. I really thought it was going to be more communal dining, and even if you didn’t eat at the same place, you could still dine together. In all actuality, they were each their own place, completely separate. Not sure if you could take food into other places. After reading reviews of all the places we decided on 24th & Meatballs. We knew we would be eating at a few places and we really did just want to sample our way around. We ordered the Balls, Balls, Balls, which is 3 meatballs (and you can choose between 4 different kinds) and 3 sauces (again, there are choices.) The Balls, balls, balls costs $6.5. It’s 3 meatballs and 2 small pieces of focaccia bread. It was good, but it would have never filled me up. I think we all agreed they were good. I liked the spicy sauce on one of them. It had kick, but not too much. The Hazelnut Arugula pesto was really good and creative on the chicken meatball. I wish I had more things to say, but I don’t. It was good, but not “I gotta get back” good. The other places weren’t what we were looking for, so we passed on them. Basa Basa didn’t have good reviews and we aren’t fans of chicken wings, so that was easy to pass up. I will go back and try Slowburger and Tails and Trotters. We did pop into the Pie Spot, but only to look around. They did have a few savory pies, and lots of tiny, yummy looking sweet pies. The truth is we were saving ourselves for Pambiche. Atmosphere at 24th & Meatballs was small, but creative. Pricing was good for sandwiches and such. The had a wall of beers, even beer in a can. Service was fine. You order at the counter, they bring it out, then you bus your own tables. And it was clean when we were there. 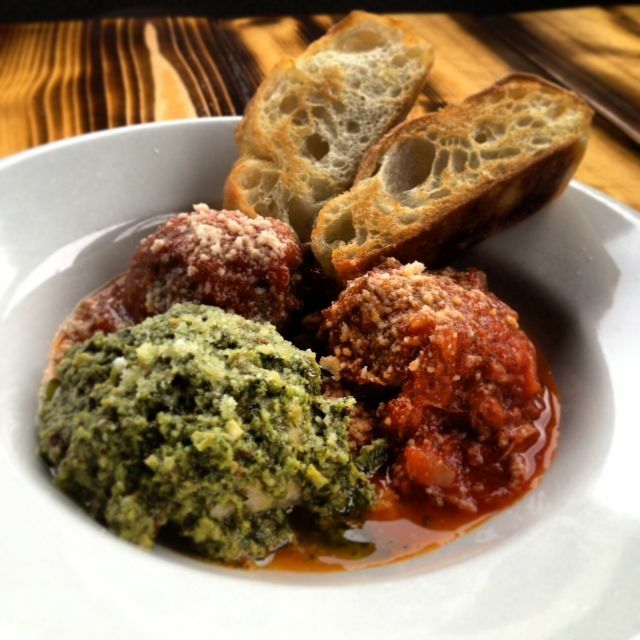 24th & Meatballs is located on 24th and Glissan.